This week’s Torah Portion speaks about the Terumah, the free will contribution the people are giving to the Lord, the materials being used to construct the Tabernacle. We also read about the dimensions of the various parts of the Tabernacle according to the pattern that Moshe saw upon the mountain of Sinai. Included in the list of items to be built was the Altar of God. In Bereshit / Genesis altars are often send to have been built (וַיִּבֶן). According to Parashat Terumah, we read the following, Shemot / Exodus 27:1 ‘And you shall make the altar of acacia wood, five cubits long and five cubits wide; the altar shall be square, and its height shall be three cubits. 27:2 ‘You shall make its horns on its four corners; its horns shall be of one piece with it, and you shall overlay it with bronze. (NASB, א וְעָשִֹיתָ אֶת-הַמִּזְבֵּחַ עֲצֵי שִׁטִּים חָמֵשׁ אַמּוֹת אֹרֶךְ וְחָמֵשׁ אַמּוֹת רֹחַב רָבוּעַ יִהְיֶה הַמִּזְבֵּחַ וְשָׁלֹשׁ אַמּוֹת קֹמָתוֹ: ב וְעָשִֹיתָ קַרְנֹתָיו עַל אַרְבַּע פִּנֹּתָיו מִמֶּנּוּ תִּהְיֶין ָ קַרְנֹתָיו וְצִפִּיתָ אֹתוֹ נְחֹשֶׁת:) Here Moshe is instructing to build the altar, its materials (shittim wood), its dimensions, and it is to be overlaid with bronze. Daat Zkenim on Shemot / Exodus 27:1 Part 1 states saying, ‘וְעָשִֹיתָ אֶת-הַמִּזְבֵּחַ וגו, “you are to construct the altar, etc. ;” the word מזבח here may be understood as an acrostic of the words: מחילה, זכות, ברכה, חיים, “forgiveness, merit, blessing, life.” Daat Zechenim says the Hebrew word for Altar (מזבח) is an acronym for four Hebrew words referring to forgiveness, merit, blessing, and life. The Altar of God symbolizes these things, a place of forgiveness where we confess our sins, of merit where an innocent life stands in place of the guilty, of blessing where the Lord hears and sends his mercy, and of life the Lord gives life through His great mercy due to the blood of the sacrifice. A Midrashic approach (based on Tanchuma Terumah 11): when the Torah wrote: “you shall make an altar of shittim wood and overlay it with copper,” what was this altar to atone for? For the effrontery characterized by a “copper-hard forehead.” We have a verse in Isaiah 48,4 where this simile is used for stiff-necked behavior. The prophet writes: ”because I know how stubborn you are; your neck is like an iron sinew, and your forehead bronze.” It is also worth noting that the letters in the word מזבח, “altar,” may be understood as an acrostic of the first letters in the words מחילה, זכות, ברכה, חיים respectively. The word שטים may also be understood as an acrostic of the first letters of the words שלום, טובה, ישועה, מחילה respectively. The measurements of five by five cubits for the length and width of the altar corresponded to the two Tablets of the covenant on each of which five of G’d’s directives had been engraved. The height described by the Torah, i.e. three cubits, is an allusion to the three redeemers of the Jewish people, Moses, Aaron, and Miriam. Thus far the Midrash. The question is asked, “what was the altar to atone for?” and answered saying “For the effrontery characterized by a ‘copper-hard forehead.’” This tends to lead us to think of the bronze age, and the use of copper + tin to make bronze, a metal that was very hard that one fashioned weapons from. This may suggest something that is built standing against God (sin, rebellion) and the rabbis parallel this to the people who were stubborn and stiff necked. They say their stiff necks were like an iron sinew and a forehead of bronze meaning that they were unwilling to listen or move according to God’s word. The commentary also states the Hebrew word for Altar (מזבח) is an acronym for four Hebrew words referring to forgiveness, merit, blessing, and life, and then concludes saying the dimensions of the altar are an allusion to the three redeemers, Moshe, Aaron, and Miriam. The rabbis connect the altar to the mercy of God (forgiveness, merit, blessing, and life) and to the Lord sending redemption through a redeemer. The altar is known as a place of establishing peace between the people of Israel and their Father in heaven. Of the two Altars in the Temple, the golden one for the incense (inside the Mishkhan) is said to symbolize the devotion of the soul; the bronze Altar for animal sacrifices is for the sanctification of the body (Midrash Tadsheh 11). It is also said about the Altar, “It wipes away sin; it nourishes the higher man; it fosters love for God; and it atones for all guilt” (Talmud Bavli Ketuvot 10b) After entering through the only door in the Tabernacle, the first piece of furniture that was encountered was the Brazen (Bronze) Altar. This where the unblemished animal was brought for a sacrifice. The worshiper would lay his hand upon the head of the animal to signify the transferring of sin onto the animal. The animal was slaughtered, the blood was caught in a bowl and the priest would divide up the animal placing the blood and the required parts from the animal upon the altar. The blood of the innocent atoned for the guilty. Here Paul wrote that Yeshua the Messiah functioned as an intermediary reconciling us to our Father God in heaven. He is begging the readers to be reconciled to God on behalf of the Messiah. The idea here being laid out in the Apostolic Writings is Yeshua the Messiah functioning as the substitutionary atonement taking our sins upon himself, the innocent dying for the guilty. The curses of breaking the Torah (Devarim / Deuteronomy 27:11-26) were placed upon him when they should be upon us for violating the command. What Yeshua did taking these things upon himself were for us for the forgiveness of sins. These things did not do away with the obligation to walk in God’s ways according to the Torah. This is what Paul wrote to the Colossians in Colossians 2:14-15. Yeshua took upon himself our indebtedness. The charges leveled against us because of our sins were nailed to the cross. 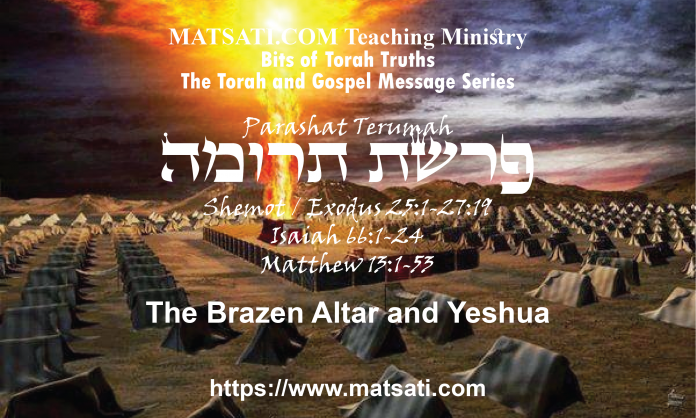 The Torah was not nailed to the cross, this is evident based upon Paul’s words, “the charges that were against us for disobeying the Law of Moshe.” The scripture, contrary to what some teach, is not saying that the Torah was nailed to the cross, but it was the “curses” of our guilt and shame, from breaking Torah, that was nailed to the tree. The Torah’s description of the Tabernacle lays out the procedure for approaching our Father in heaven. At the entrance of the Tabernacle, we confess our sins, and make atonement upon the altar. This is first and foremost in our Torah centered approach to God. The Apostolic Writings is calling upon these things laying out the procedure that we come humbly confessing our sins in repentance in Yeshua the Messiah first and foremost. Sin is our first problem just as the Scriptures say, “The soul that sins shall die.” (Ezekiel 18:20). Throughout the Scriptures, we read blood makes atonement, and this is the reason why it was forbidden to eat the blood because it was given to make atonement upon the Altar, as we read according to Vayikra / Leviticus 17:10-13. חמש אמות, “five cubits (long).” This alluded to the Tablets, five of which commandments were engraved on one Tablet. The width of the altar, also five cubits, was to allude to the second of the Tablets; its height of three cubits was to allude to the three redeemers, i.e. Moses, Aaron and Miriam. Some commentators see in the measurement of three cubits for its height a reference to how much it rose above what has been described as רשת, a brass network, which was part of the altar’s walls. (Talmud, tractate Z‘vachim, folio 60).This “network” of copper, halfway up the sides of the copper altar may be viewed as if it were some kind of garment, something decorative. Its upper edge was five cubits from the ground. The section known as karkov, ledge extended from the upper end of the network to the surface of the altar which had four cube shaped corner posts each one cubit high and wide. The “roof” of this altar was five cubits square (external measurements, i.e. approximately three meters) The usable surface therefore was diminished by 60 centimeters at each corner where the corner posts, known as “horns” were positioned. The area comprising one cube square in the center of the roof of this altar was where the maaracha, the firewood for burning the sacrificial animals was kept. Even though the Torah does not spell out the details of the ramp leading to the top of the altar, it is understood that there was such a ramp, as it was forbidden to ascend the altar by means of steps. (Exodus 20,23) This ramp was at the south side of the altar rising northward. The Talmud in tractate Z’vachim, folio 62 explains why it was impossible for that ramp to have been positioned elsewhere. It is in error to claim that the Torah categorically forbade this type of sacrifice. The importance of the blood atonement was proclaimed to Adam and Eve, prefigured in the Akedah, and spoken directly by the prophets as we see written here in the book of Isaiah. All of these things are very important in relation to the One whom God had sent to save us from our sins, the sacrifices, blood atonement, etc. Something to note however in regards to these things. We read Paul saying in 1 Corinthians 1:18 For the message of the cross is foolishness to those who are perishing, but to us who are being saved it is the power of God. (NIV) The proclamation of the cross that Yeshua hung upon as the means for atonement seems to run as an offense to the idea of “merits” taught in traditional Judaism. Remember how it is taught in the Talmud Bavli Berakhot 17a “among the disciples engaged in the study of Your Torah, … my fat and blood that diminished be considered as if I offered a sacrifice before You on the altar…” The idea here is to the significance of the Temple sacrifices and atonement by blood, and Torah study. The idea of Faith in Yeshua and what he did on our behalf, his merit, are antithetical ideas that underlie the issue with the question of how a person obtains atonement in Judaism. This is the very reason many reject Yeshua as their Savior. According to the Tanach and the Apostolic Writings (NT) there is a righteousness before God, and a righteousness by the way that we live our lives for God. One is related to the atonement upon the Altar. The other is related to the Spirit of God living in our hearts empowering us to walk in His ways. The question is whether it is faith in God’s Messiah, or is it through performing enough mitzvot that we receive these things (forgiveness, merit, blessing, and life)? The symbol of faith for the followers of Yeshua is in the Altar of God, confessing our sins, repentance, and trusting in God’s forgiveness and salvation that is given in the Messiah. Similar to what the Rabbis say in the Talmud Bavli Berakhot 17a we visualize going before the Lord, confessing our sins before God, and believing Yeshua bore in himself our iniquities. Here the blood is given as a means for the admission of our guilt before God, bringing a sacrifice, and receiving the forgiveness offered to us through the blood of the acceptable sacrifice. Studying the Scriptures, what we are taught in the Apostolic Writings is consistent with what we read in the Tanach, the Torah, and the Rabbinic literature.